Pyxis featured in SPIE - Polaris Sensor Technologies, Inc.
Polaris’ oil detection technology is featured in SPIE article written by David B. Chenault and Justin P. Vaden of Polaris Sensor Technologies, Inc. and Douglas A. Mitchell and Erik D. Demicco of Arctic and Environmental Technology ExxonMobil Upstream Research Company. Click here to go to website. The Deepwater Horizon incident (April 2010, in the Gulf of Mexico) is a well-known example of a large-volume oil release (210,000,000 gallons) that had a considerable impact on the marine and coastal environment, as well as significant response costs and economic fallout. Less-well known are smaller-volume spills (typically a few gallons from natural, industrial, or recreational sources) that are regularly reported and archived by the US Environmental Protection Agency’s National Response Center. For example, 30 smaller incidents between New Orleans and Mobile Bay were reported in July 2016.1 There are various issues, however, that hamper the recovery of all oil spills. For relatively small spills, the response is heavily dependent on the ability to locate the spill—based on sporadic, and sometimes non-specific reports—and to determine its size. For larger spills, although a coordinated response team may be continually on site, recovery operations are usually limited to daylight hours. In addition, updates on the spill location are required each morning before the recovery operations can begin, which often causes hours of delay in oil recovery or mitigation. 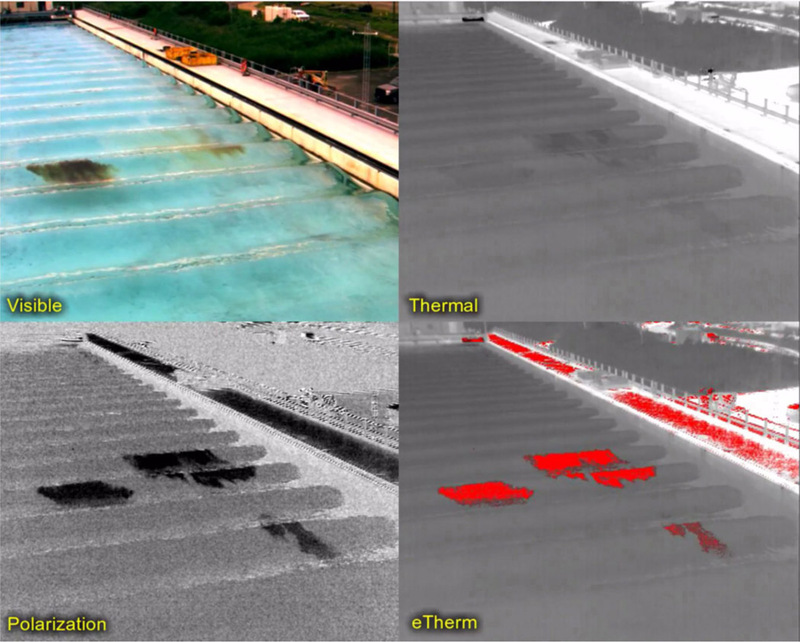 Although IR imaging may be used to detect oil spills, the thermal contrast between oil and water is often small and makes IR detection difficult. Wave action only confounds this problem. For all spills, the ability for personnel to quickly and easily detect oil on water is therefore clearly needed, so that an appropriate, consistent, and cost-effective response can be implemented. In particular, the potential to perform these functions automatically would be a great boon for oil responders. It would also provide an opportunity for regular monitoring around drilling operations and facilities, transfer points, ports, and harbors. For many years, our team at Polaris Sensor Technologies Inc. has been developing imaging polarimetric sensors that operate across the optical spectrum. For example, with our Pyxis® 640 LWIR (long-wavelength IR) sensor (see Figure 1) we exploit the polarization of emitted light.2 When ambient illumination is reflected off of an object, the reflected light becomes polarized. Likewise, at thermal IR wavelengths, light is polarized upon emission. Polarization—along with intensity and wavelength—is a fundamental aspect of light, and the three entities are independent of each other. This means that two beams of light, with the same intensity and wavelength (or spectral distribution), can have very different polarization states. Furthermore, the strength and orientation of an IR polarimetric signal is a function of several factors (i.e., the surface temperature, surface roughness, material properties, aspect angle to the sensor, down-welling sky radiance, and background radiance of objects in the scene), and the polarization signature of objects with different material properties is different from that of the surrounding background. Importantly, that difference is often present even when the object of interest is in thermal equilibrium with the background.3, 4 An object can therefore be completely invisible in a standard intensity image, while simultaneously exhibiting a strong polarimetric signature. In the past, measuring these signatures has required large scientific instruments that were not suitable for hand-held use. The recent development of uncooled, IR sensor arrays has allowed us to develop high-performance, low-size, weight, and power (SWaP) polarimetric sensors. With our Pyxis LWIR polarimetric sensor—in which we mount the microfilter array close to the microbolometer focal plane array—we measure the conventional thermal intensity of a scene, as well as the polarization magnitude and the orientation of the plane of polarization.5 By measuring the polarization, we can extract details from a scene that are not readily apparent when using conventional thermal imagers alone. With Pyxis, oil and water can be differentiated as a result of the polarimetric difference of their optical properties. Furthermore, because the polarization signal is based on emission, Pyxis can be used for oil detection both day and night. Figure 1. 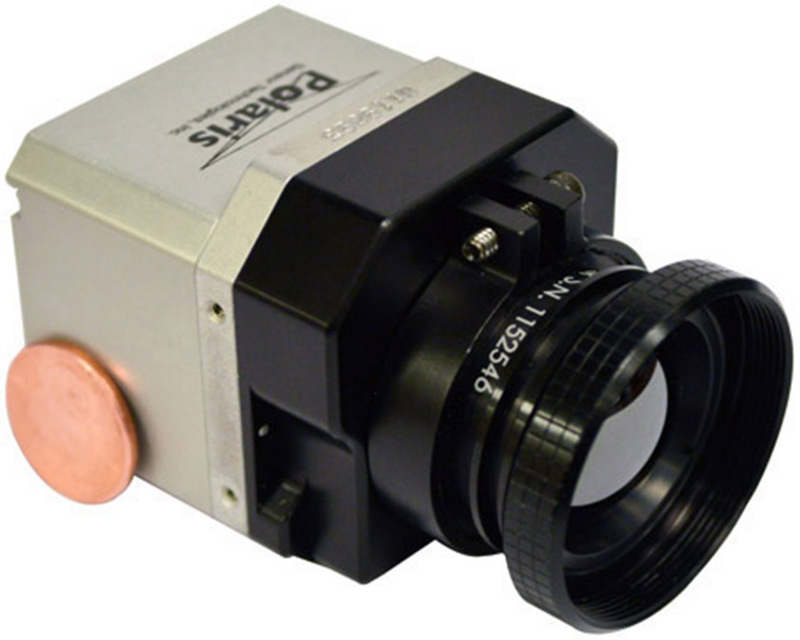 Photograph of the Pyxis®LWIR (long-wavelength IR) polarimetric sensor. In this camera, the microfilter array is mounted in close contact with the microbolometer focal plane array. In 2015, an oil pipeline in the vicinity of Santa Barbara, CA, ruptured and resulted in a spill into the Santa Barbara channel. 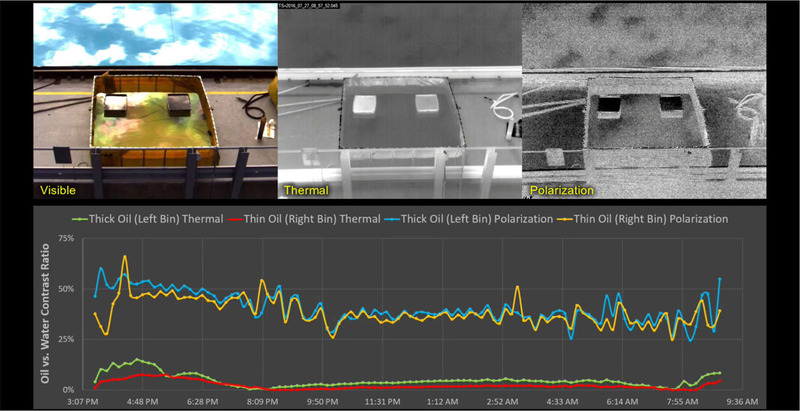 We used the Pyxis sensor to conduct an aerial survey of the spill, which provided a significant improvement in oil detection compared with conventional thermal cameras (even after cleanup efforts were completed). We have subsequently (in July 2016) had the opportunity to test our Pyxis sensor at Ohmsett (the National Oil Spill Response Research and Renewable Energy Test Facility in New Jersey), with partial support from ExxonMobil Upstream Research Company. This test facility (see Figure 2)—maintained and operated by the US Department of Interior’s Bureau of Safety and Environmental Enforcement—allows independent, objective performance testing of oil response equipment on a large scale and in as realistic an environment as possible. For these tests, we pointed our Pyxis LWIR 640 imaging polarimeter at a number of controlled spills.6 In this way, we were able to test how the instrument’s detection performance varied as a function of the time of day, angle, oil type and thickness, and with the evolution and motion of several oil types in both flat and wavy water. Figure 2. Top: Aerial photograph of Ohmsett (the National Oil Spill Response Research and Renewable Energy Test Facility) in New Jersey (provided by Ohmsett). 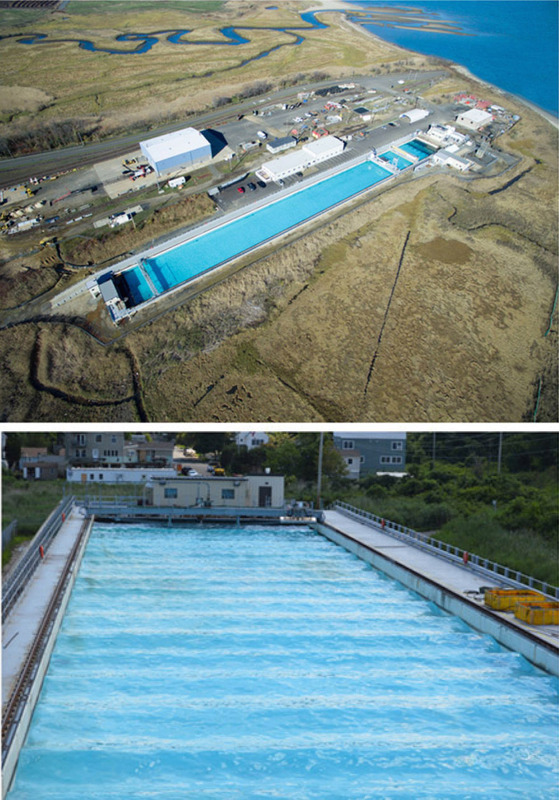 Bottom: Photograph of wave action in the large Ohmsett saltwater tank (provided by Polaris Sensor Technologies Inc.). The results from one of our tests are shown in Figure 3. In this test, diesel fuel and two types of crude oil were dumped into the test tank, in the presence of waves. We compare the polarization image (in which more polarized areas appear darker) we obtained with Pyxis (lower left) with data collected from a conventional color camera (upper left) and with a conventional thermal image from a commercially available uncooled microbolometer (upper right). In our Pyxis polarization image, three distinct spills are detected. The two larger areas consist of the two different types of crude oil and the smaller spill (in the lower right) is the diesel fuel. It is easy to see one of the crude oil spills in the visible image, but it is not readily apparent in the thermal image. The thinner crude oil spill is not easy to observe in the visible image, and although it has slightly better thermal contrast, the polarization signal is very strong. In addition, the diesel spill is imperceptible in the visible image, and nearly so in the thermal image, but it is a strong presence in the polarization image. We also show a Pyxis fusion of the thermal and polarization imagery (in the bottom right of Figure 3) that allows both types of data to be displayed in a single image, and provides important context for the operator. By using the algorithms that highlight the red regions in this ‘eTherm’ image, automatic spill detection with alarms can be configured. Figure 3. Visible (upper left), thermal (upper right), degree of linear polarization (bottom left), and eTherm, i.e., fused polarimetric and thermal data (bottom right) images obtained during the Pyxis testing at Ohmsett. Three oil spills (with thicknesses of between 40μm and 1mm) can be seen in the polarization and eTherm images. The 700ml diesel fuel is invisible in the color (visible) image, and all three have poor contrast in the thermal image. For scale, the white-colored deck to the right of the pool is about 12 feet wide. The man-made structures around the tanks are also polarized. In all cases, our Pyxis IR polarimetric data exhibited significantly better detection than thermal IR measurements alone. For example, we were able to regularly detect oil with a thickness of less than 100μm in both flat water and in wavy conditions (we were even able to make successful detections in breaking waves). In addition, the results (see Figure 4) of a time-lapse overnight test illustrate that the detection performance (i.e., contrast) from our polarization imagery is 3–50 times better than from thermal imaging (using a standard contrast metric). We also found that the polarimetric contrast was consistent throughout the night, whereas the thermal contrast essentially disappeared for two periods during the test. Figure 4. Illustration of a controlled overnight time-lapse test, conducted over an 18-hour period, with two bins of oil in a water background. The bin on the left (in the upper row of images) was filled with water and 1000ml of oil (giving an oil thickness of 5mm), and the bin on the right was filled with water and 100ml of oil (giving an oil thickness of 0.5mm). Visible color (left), thermal (center), and polarization (right) images of this experimental setup are shown. The results of this test are given in the bottom graph. The green and red curves illustrate the oil versus water contrast ratio (the Michaelson contrast) for the thermal image time-lapse sequence. The blue and yellow curves, however, show the much better contrast obtained from the polarization image sequence. In summary, we have conducted a series of tests that clearly demonstrate the potential for man-in-the-loop detection of oil spills and leaks through IR polarimetric imaging with the Pyxis sensor. It is possible to pan/tilt-mount this instrument on a mast/elevated position on tankers, transfer points, drill platforms, or unmanned aerial system for remote monitoring by an operator. With the very strong contrast between oil and water that we achieve, we foresee many potential applications of Pyxis, e.g., for continuous automated detection and monitoring of operational and abandoned oil rigs and platforms, ports, and harbor entrances (where illegal bilge dumping is a real problem, particularly at night), as well as for oil spill tracking during recovery operations. We anticipate future work in which we will conduct controlled testing of additional types of oil. We will also investigate the effect of aging so that we can further validate the use of Pyxis for oil spill applications. We hope that our technology will be used by oil response teams to help mitigate future oil spills. Development of the Pyxis technology was partly funded through the Small Business Innovative Research program. The work at Ohmsett was performed in conjunction with ExxonMobil Upstream Research Company.